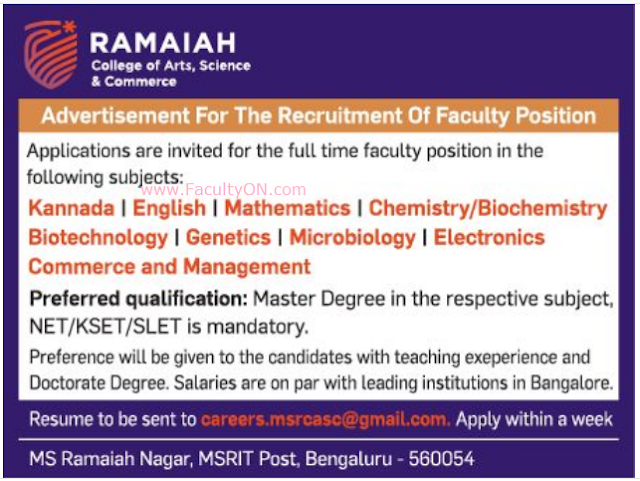 Ramaiah College of Arts Science & Commerce, Bangalore has advertised for the recruitment of Teaching Faculty- Assistant Professor jobs vacancies. Interested and eligible job aspirants are requested to apply within 07 days from 21st November 2018. Check out further more details below. About College: Ramaiah College of Arts, Science and Commerce was founded in the year 1994 by Late Dr. M.S. Ramaiah. It is now under the Umbrella of Gokula Education Foundation. Dr. M.S. Ramaiah’s vision was to provide quality education affordable to common man. The college does not merely educate youth to excel academically; It also ensures that our students are better human beings by the end of their course. Our faculty members are dedicated to provide quality education of standards and inculcate integrity to our students.